Friday, April 19, 2019 Doors open at 6 pm. Program begins at 7:30 pm. The Kingdom Hall of Jehovah’s Witness (Goldsboro) warmly invites you to meet with them to observe the anniversary of Jesus’ death to observe the memorial that he instituted. You will hear an explanation of how his death can benefit you and your family. How will this promise be fulfilled? 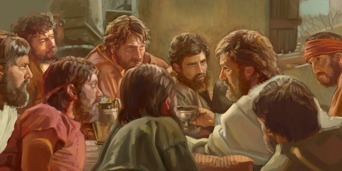 In the hours before he died, Jesus assured his faithful apostles that they would be with him in his heavenly Kingdom. (Luke 22:28-30) He later promised a condemned criminal: “You will be with me in Paradise.” (Luke 23:43) How will those words come true? The fulfilment of both promises is possible because Jesus surrendered his life for mankind, even for sinners like that criminal. Jesus’ sacrifice was so vital that he commanded his followers to commemorate it.—Luke 22:19, 20.